You may have already installed WP Remote on your website before adding the site to the WP Remote web interface. You will have found that when you try to active the plugin you are asked for an API key. To get the API key you will need to create a user account on wpremote.com. Follow the instructions in Creating a User Account. Once you are logged in to your account you can start to add your sites. To add a new site, click on the + button. Then click the green Add Site button. WP Remote will load the data from your site; you may have to wait a few seconds while this takes place. The General Settings screen will be shown. Scroll down to the bottom of the screen to the API key code. Copy this code and return to the WP Remote plugin installation your website. 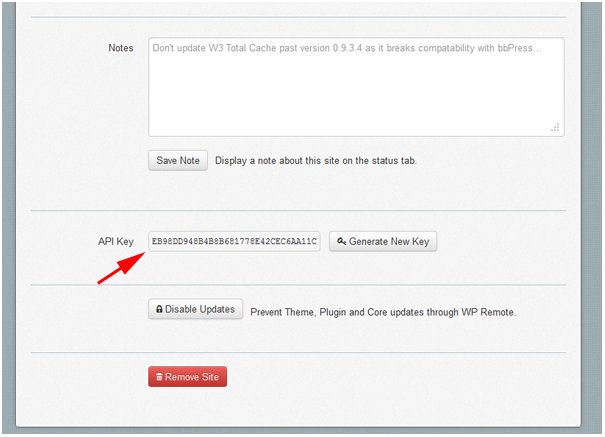 You will need to enter your API key at the top of the screen and click the Save API Key button. Finally, close the browser window containing your website and return to the browser window with the WP Remote website interface. Click on the refresh icon in the top right hand corner of the site information box.